Africa has a wealth of natural resources that are the envy of the world, one of them being cacao beans, so why is it that the continent is not known for producing the finest chocolate when it sits on the finest raw ingredients? Well that's now changing, thanks to a new generation of African women chocolatiers who are turning their passion for chocolate into exciting new proudly African artisan chocolate brands. Who doesn’t love chocolate in all its forms? From a big comforting slab of rich dark chocolate, to a beautifully boxed selection of truffles and other delicious chocolate confections, to a richly dark ganache covered chocolate cake. It makes us feel good, it turns out it’s actually quite healthy for us, and the smell of chocolate increases theta brain waves, which triggers relaxation. So, what’s not to love. Here’s an interesting fact - did you know that it takes 400 cacao beans to make just one pound (450 gr.) of chocolate? Here’s something else you might not know. Africa has a long history of producing some of the finest cacao beans on the planet to feed the world’s love affair with chocolate. But up until recently those precious raw materials have been sent to other countries around the world to be turned into the finished chocolates we all love, and very little chocolate has actually been produced on the continent. However, all that is changing now as a new generation of passionate women chocolatiers is emerging in different creative cities across Africa. They are creating world class chocolates, beautiful proudly African artisan chocolate brands, and all with great back-stories. It is really positive news for a continent that is looking to create more of the products that the world loves to buy, using and celebrating raw local ingredients, and training and developing a new generation of talented chocolatiers in the process. So, as you all get ready to celebrate World Chocolate Day on 7 July, why not show your love of chocolate and all things proudly made in Africa by getting to know the women chocolatiers who are putting Africa on the global map, and sampling the amazing chocolate they are producing. Your tastebuds will thank you for it. Read their inspirational stories below. For all true chocolate lovers out there who are constantly on the search for the purest of taste sensations and the highest quality ingredients, there is a new, proudly African brand that is getting people talking. Chocoloza, the brainchild of entrepreneur and passionate chocolatier, Vicki Bain, combines the best Belgian chocolate with the finest local, fresh African ingredients. The result is a taste sensation unlike anything else you will taste in the chocolate world. Read Vicki’s story here. '57 is the pioneer bean to bar chocolate business in Ghana defined by creativity and luxury, and created by sisters Kimberley and Priscilla Addison. This venture uses resources grown within the country to create delicious, whimsical chocolate treats. 57 hones in on Ghana’s Independence Day spirit and challenges the status quo that premium chocolate can only be made in Europe. At 57 these tenacious, creative entrepreneurs take dried cocoa beans and process them into luxurious chocolate and confections that are a reflection and celebration of Ghanaian art and culture. Read Kimberley and Priscilla’s story here. With the launch of the #Choose Artisan campaign recently, the spotlight has been firmly shining on Africa’s amazing women artisans, particularly those producing world-class, luxury products. One such woman artisan attracting global attention right now is the talented Jaki Kweka, Founder of Chocolate Mamas Gourmet Tanzanian Chocolate Co. which is the country’s first and only indigenous producer of fine chocolate. Read Jaki’s story here. The delicious Cote d’Ivoire chocolate brand, MonChoco, is lovingly and carefully prepared in the workshop of founder Dana Mroueh, located in the heart of Abidjan. She is the latest entrepreneur in the country to become a chocolatier using Ivorian cocoa beans. Mon Choco’s products are made from cocoa beans exclusively from West Africa, reflecting the exceptional taste of this precious soil. MonChoco is one of only a handful of chocolatiers in the world to make its chocolate from A to Z and unique in West Africa for our raw confection. The lack of cooking of the cocoa beans preserves at best its taste and nutritional properties. It is rich in antioxidants, fibers, proteins, minerals and trace elements. The fruity, woody taste and the benefits of our raw chocolate are our signature. Read Dana’s story here. For many consumers today, understanding and appreciating the provenance of the food we eat is increasingly important and part of the buying decision-making process. Therefore, for lovers of artisanal chocolate with a farm to table story, the mother and daughter team of Melanie Finch Keshwar and Ann Finch, the creative team behind The Chocolatiers in South Africa has a great story to tell. Read Melanie and Ann’s story here. For the many people who long for the wonderful taste of chocolate but their dietary regimes mean it is not an option, Kenyan entrepreneur Jazeera Suwani, founder of Say it with Chocolate, has the answer. She has created a business making fabulous handmade chocolates that specifically cater for those who are lactose intolerant or vegan, meaning that now no-one has to miss out on one of the world’s most beloved taste sensations. Read Jazeera’s story here. Chocolate lovers who are on the look out for high quality, handmade chocolates that are produced using the finest ingredients and that are also gluten free, have found a champion in Sanja Hanekom, the founder of Noir Chocolates SA in South Africa. 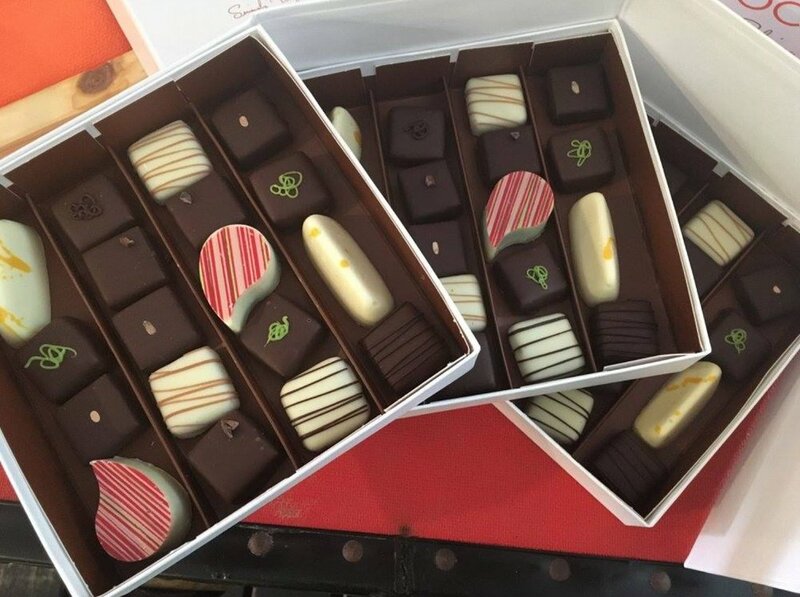 She is creating delicious and beautifully presented chocolate gifting ideas for individuals and corporates alike, and winning chocolate fans over in large numbers in the process. Read Sanja’s story here.